Natural antioxidants and anticarcinogens in nutrition, health and disease represents the most recent information and state-of-the-art knowledge on the role of antioxidative vitamins, carotenoids and flavonoids in ageing, atherosclerosis, and diabetes, as well as the role of natural anticarcinogenic compounds, particularly lignans and isoflavonoids, and cancer prevention. It is highly interdisciplinary, and will be of importance to all scientists working in the medical, biomedical, nutritional and food sciences as well as the academics. 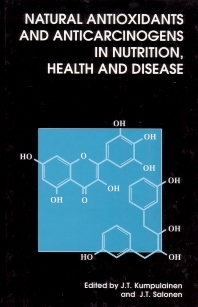 Oxidative stress in cardiovascular dieases, cancer and ageing; Oxidative stress and antioxidants in type II diabetes; Dietary intake, bioavailability and antioxidative effects of flavonoids and phenolics; Antioxidative effects of other natural antioxidants and measurement of oxidative stress or damage; Natural antioxidants or pro-oxidants in foods and nutrition.